Ever felt determined to lose weight but unable to suppress that constant feeling of hunger? Well, the feeling of satiety is linked to hormones in your body. These hormones regulate when to tell you are hungry and when to let you know you are full. The main hormones involved are leptin and Ghrelin. Another hormone said to play an important role in appetite, is serotonin. This review examines the product Extreme Saffron Matrix by Health Beauty Supplements which has tapped into that theory. The product claims to not only suppress appetite and fight cravings, but to increase metabolism and energy levels as well. Other benefits associated with the product include a decrease in anxiety levels, asthma, heartburn, insomnia, pain, menstrual stress, and atherosclerosis. 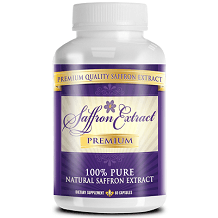 Saffron Extract (88.5mg per capsule) is the main active ingredient in the product and is said to enhance the effects of serotonin. Saffron is commonly used as a spice extracted from the Crocus Sativus plant and is very labor intensive to harvest, making it the most expensive spice per gram. Unfortunately, the adequate daily value has not yet been established for saffron extract. One capsule is to be taken twice a day. It is recommended to take it 20-30 minutes before a meal to see the most effective results. 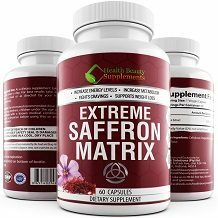 Healthy Beauty Supplements claims that Extreme Saffron Matrix has no reported side effects. Saffron extract has been associated with side effects such as dizziness, dry mouth, headache, drowsiness, and nausea, but this is seldom. This product is available online from the manufacturer’s website for a discounted price of $17.99, down from $29.99, for 60 capsules. It is also available to purchase online from other third-party websites, like Amazon. The manufacturers provide a 90-day 100% money back guarantee if you are not satisfied with the product in any way. Health Beauty Supplements’ Extreme Saffron Matrix seems to work well as an appetite suppressant and have numerous added benefits associated with it as well. The money back guarantee is also reassuring that the product’s manufacturers believe in it. We did, however, find numerous negative reviews on the product which is concerning. This, along with the fact that the adequate daily value of saffron extract has not yet been established, means we cannot recommend this product as the best one available to suppress your appetite. We recommend conducting thorough research about related products before making a more informed choice.